Duke Reinhold IV. of Liege and Guelderland having died in 1423 without issue, his duchy, Gueldern, fell to Arnold of Egmont, while Adolph of Berg became possessor of the Duchy of Liege. But Arnold, believing that Adolph had taken the lion's share in the inheritance, attempted at first to right himself by force of arms. He consented, however, afterwards to a compromise, and a truce of ten years. But, when after the death of Adolph in 1437, his cousin, Gerhard V., Count of Ravensberg, inherited the Duchies of Liege and Berg, Arnold re-appeared with his old claims, and entered with an army into the territory of Liege. In confidence of his right, Gerhard gave him battle (3rd November, 1444) near Ravensberg in Westphalia, in which he was victorious, and completely routed his foe. In commemoration of that happy event, which took place on the feast of St. Hubert, (3rd November), Gerhard founded an Order which he placed under the patronage of that saint, and gave it originally the name of the Order of the Horn, the Knights being used to wear a golden chain composed of bugle-horns. The Order flourished until 1609, when the male dynasty of the Liege house became extinct at the death of John William. Since then, the Order was forgotten for nearly a whole century owing to the pending disputes about the inheritance, as also to the intervening Thirty Years' War, and it was at last rescued from oblivion by the Elector of the Palatinate, John William of the House of Neuburg, on the 29th September, 1708. Having inherited a part of the territory to which the Order previously belonged, he declared himself Grand Master of the revived institution, gave it a constitution and new statutes ; and bestowed upon the first twelve Knights of the Grand Cross, who were Colonels in the army, the possession of small tracts of land. The Order consisted under the Elector, as Grand Master, of twelve Counts or Barons, and an unlimited number of Princes and noblemen who did not belong to any other order. The nomination was vested in the Chapter, who voted by majority ; the candidates elected were obliged to pay 100 ducats entrance fee for the poor. The Knights wore a large red ribbon, and upon the breast a silver Cross within a gold embroidered star with the inscription : "In Fidelitate constans" (Constant in loyalty). The two successors of John William still further enlarged the statutes ; but the last and still prevailing ordinances are those promulgated by Maximilian Joseph IV. (first King of Bavaria) on the 18th May, 1808. He declared the Order the first in the kingdom, and brought it into connection with that of Civil Merit, by decreeing that candidates must be members of six years' standing of the latter. The Order counts now only twelve Knights from the ranks of Counts and Barons, exclusive of the Sovereign, and the members whom the latter may, in addition, choose to nominate from among the Princes, both native and foreign. The Chapter is annually held either on the 29th September, the day of the renewal of the Order by the Elector, John William, or on the 2nd February (the festival of the Virgin Purification). The entrance fees are now 200 ducats in gold (about £100) for Princes, and 100 ducats (£50) in gold, besides 100 rixthalers (£20) for Counts and Barons. 1. Of a star (No. 1) worn by the Knights embroidered in silver upon the left breast. 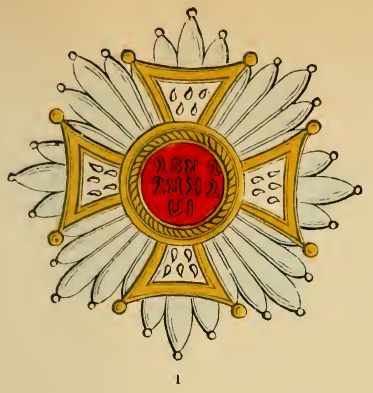 Upon that star is attached a cross embroidered with silver and interwoven and mounted in gold ; it contains in the middle a round field of flame coloured, or poppy-red velvet, with the motto of the Order : "In Treu vast" (Constant in loyalty) in golden Gothic letters. 2. 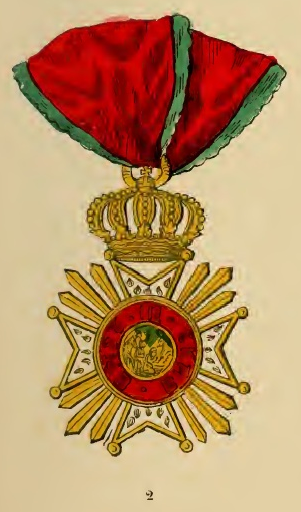 Of a poppy-red ribbon, about three and a half inches wide, with narrow green borders, worn across the left shoulder towards the right hip, on which is suspended an octagonal large cross, white enamelled and blazing with gold, while between each of the arms of the cross are seen three golden points, and above the whole the royal crown. The central field represents, on the obverse, the history of the conversion of St. Hubert, with the above motto in a red ring. 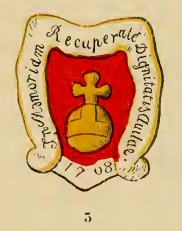 The reverse contains the Imperial ball, with the Cross in the shape of a globe, and with the inscription : "In memoriam recuperatse dignitatis avitse, 1708" (In memory of the restoration of the original dignity, i. e. the Order). (Nos. 2 and 3). This great Cross, together with the large chain, are, however, only worn on certain festivals, nor is it allowed to adorn the chain with precious stones. 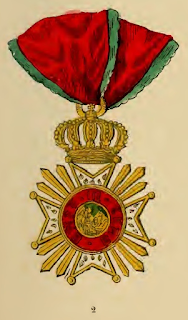 The daily decoration of the Knights (by fine of 20 thalers for each omission) is a small Cross, which may be adorned with a few precious stones in proportion to its size. 3. Of a golden chain of forty-two links, of which twenty-one represent, in oblong squares, the history of the conversion of St. Hubert ; while the other twenty-one, which are alternately red and green, contain the Gothic initials in monogram, of the words : "Treu vast". The costume, on festival days, is the Imperial mantle dress i. e, a black collar, a sash of the same colour ; narrow, short breeches with poppy-red garters and bows, and a short black mantle after the old Castilian fashion, plume and sword.